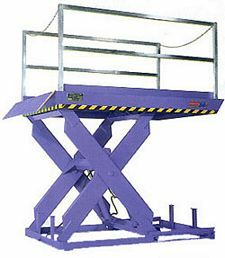 Dock lifts are utilized in many warehouses and factories to help transition between trucks and docks of varying sizes. There are portable lifts for lighter loads, top-of-ground lifts for situations when you cannot use a concrete pit, and pit-mounted lifts. Each lift is designed to handle a specific piece of handling equipment, such as carts, pallet jacks, straddle stackers, and sit-down rider fork trucks. The place to start when you specify a dock lift is to match your application with the correct capacity lift. Generally, pit-mounted dock lifts can run from 5,000 to 30,000 pounds capacity. Portable dock lifts offer less, at 5,000 to 6,000 pounds, while top-of-ground dock lifts offer a capacity range of 5,000 to 12,000 pounds. If you know the weight of your expected loads and the weight of handling equipment, this allows you to specify the right capacity lift. What equipment are you using to unload trucks? If you are using a forklift, you’ll need a higher capacity than if you are using carts or pallet jacks. For loading and unloading hand carts, four-wheel carts, and manual pallet jacks, you will need a dock lift in the 4,000 to 6,000 pound capacity range, with platform sizes in the 6’ x 6’ to 8’ x 10’ range. These are usually portable or top-of-ground lifts. To deal with powered pallet jacks, walkies, straddle stackers, and small forklifts, you’ll want a dock lift with a capacity range from a minimum of 8,000 pounds to around 10,000 pounds with a platform size range of 6’ x 8’ to 8’ x 10’. This range of lifts are usually either top-of-ground or pit mounted. To load and unload using sit-down rider fork trucks and other heavy loads, you’ll need a heavy duty dock lift in the 12,000 to 20,000 pound range with a large platform of 6’ x 10’ up to 8’ x 12’. These lifts can be top-of-ground, but are almost always pit-mounted. When considering a way to deal with this, remember that dock levelers offer a working range of approximately 39” to 54”; a dock lift is much more versatile, offering a range from zero to 58”. Because of this, a dock lift can essentially service all the trucks that come to your facility. If your dock is too high or too low, or if you don’t have a dock, dock lifts are often the best answer. Given the fact that many facilities may see all of the above (and probably a smattering of other) truck types, having the flexibility to load and unload at any height can become increasingly valuable. Conformance to OSHA, ANSI, BOCA, the NEC and CS 202-56 for safety is essential. Check with your dock lift vendor for the necessary compliances to code for your application. Get it in writing—if the lift complies, the manufacturer will have documentation. Dock lifts must be connected to electrical power. this may require wiring to the lift's location. You may also need a building permit to install these lifts. Check your local building codes. Construction costs for pit-mounted lifts, while less expensive than truck well or concrete ramp costs, should factor into your decision. A pit mounted dock lift must be placed on a concrete pad. Especially in the case of a pit-mounted lift, the cost of the lift itself is only part of the overall total cost. Dock lifts offer cost advantages for many loading dock operations. They typically cost about a third the price of a lift truck, and allow you to receive trailer loads without extensive concrete ramp construction. Payback is often quick compared to the alternatives of concrete ramps and custom docks. Dock lifts can also contribute to an overall safer operation by eliminating manual handling—carts, pallet jacks and forklifts can access trucks that they cannot reach without a dock lift. When trucks don’t line up with your existing docks, chances of an accident escalate. Dock lifts can eliminate that problem. When specified correctly, a dock lift can be the best loading and unloading solution. While this guide offers some tips in general, it is always best to consult a professional about specifics to your situation.